Lieutenant Governor Iona Campagnolo speaks with unidentified woman in background. 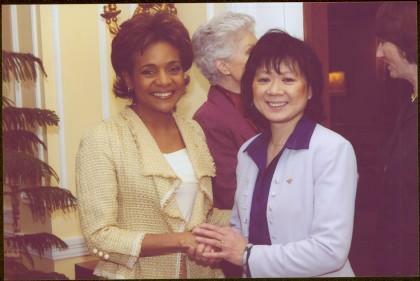 Photograph taken during Michaëlle Jean’s visit to Government House, Victoria, B.C. ; see also items 2009.6.1.616 - 2009.6.1.625.